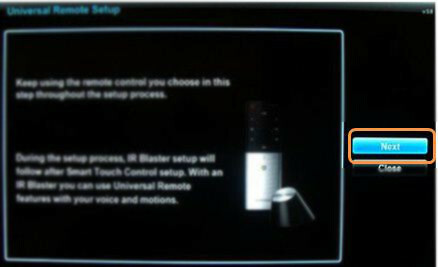 How to setup IR Blaster in Samsung E Series SMART TV? Important : The Universal Control is limited to Blu-ray players and Set-Top-Boxes. 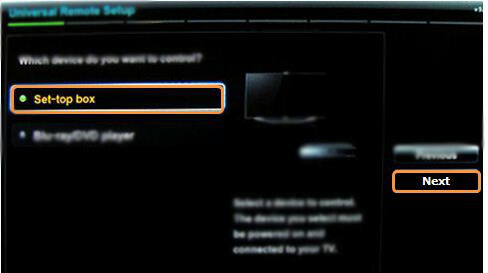 The Universal control function cannot be used with Home Theatres, DVD players or other device. 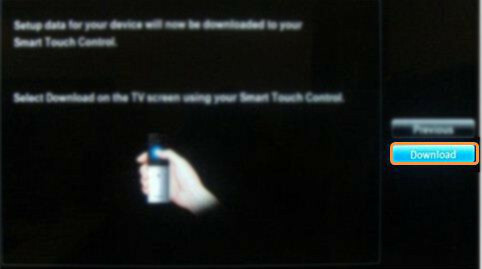 NOTE : Samsung TV should be connected to Internet and Smart Touch Remote & IR Blaster should be paired with your TV. a). 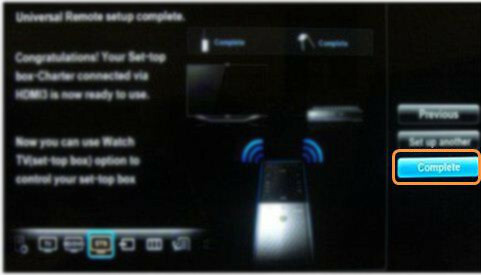 Press the Short Cut Function key on your Smart Touch Remote. 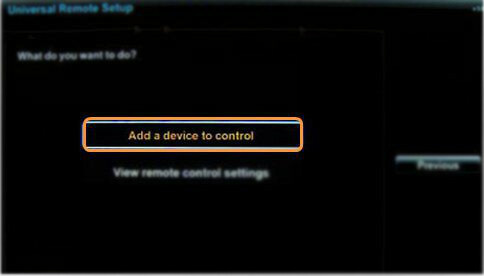 Use the touch pad to select the Universal Remote Setup icon on the far left, and then press down on the center of the touchpad. b). 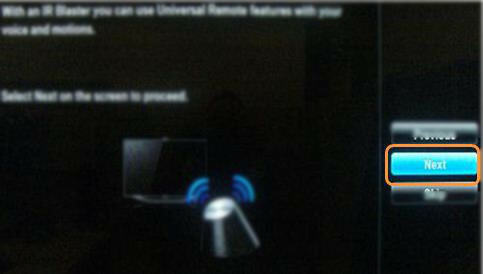 The Universal Control on-screen setup will appear. Next will be highlighted, push down on the center of the touchpad to continue. d). Select the type of device you like to set up. Here we are selecting Set-Top-box, press down on the center of the touchpad after making selection. Next will be highlighted, again press down on the center of the touchpad to continue. e). 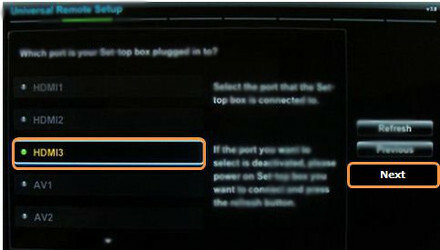 Select the Source that your external device is connected to, and push down on the center of the touchpad. Next will be highlighted, again push down on the center of the touchpad to continue. f). 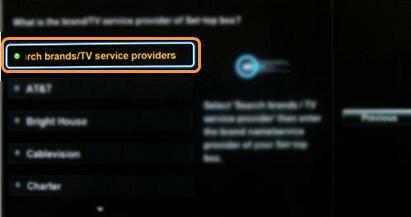 Select the brand or service provider of your Set-top-box, and then push down on the center of the touchpad. g). 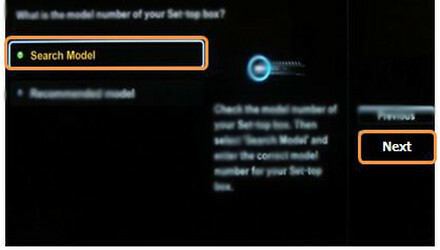 Select Search Model, make your selection and then press down on the center of the touchpad to continue. Next will be highlighted, press down again on the center to continue. i). The setup will now download IR Commands for that model from the server. Download will be selected by default. Press down on the center of the touchpad to begin download. j). 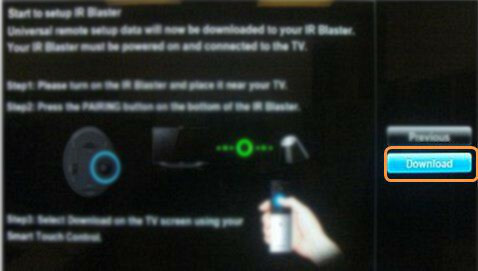 After downloading commands, the TV will explain you that if you use the IR Blaster you will be able to voice and gesture commands with your set-top-box. Next will be selected by default, press down on the center of the touchpad to continue. m). Select Yes to exit.